"La passione per la musica si trova nel cuore. Rimane sempre con me." "The passion for music is in my heart. It never leaves me." New stars appear on the musical firmament at regular intervals, and we hear about child prodigies who can play or compose music at the tender age of three. Gifted artists continue to amaze us with their dazzling performances. One of the most interesting musicians of our generation, a naturally gifted pianist who dismisses the idea that she was a child prodigy, is the Italian Gloria Campaner, who had her first piano lesson when she was four, gave her first recital when she was five and made her debut with the Venice Symphony Orchestra - an exciting experience for a young girl - when she was twelve. "Every musician rembers the first time he played with an orchestra," says Gloria, "it's fantastic. It's the first time you are in the middle of the sound. Suddenly you are surrounded by the sound of an orchestra and by all the different instruments, which is an unforgettable experience. I had to play a piece by the contemporary Italian composer Margola, which was technically quite difficult to perform. But I was really hardly nervous at all. Maybe I was too young!" Now, at the age of 28, Gloria can look back on a splendid career in which she has won more than 20 national and international prizes and has studied under great piano teachers. She has performed as a soloist, with orchestras and in chamber ensembles, with amazing musicians. Recently she has formed a duo with Sardinian-Romanian violinist Anna Tifu. They will play in the Verdi Hall for the Società dei Concerti in Milan on 14 January, and in the Auditorium Parco della Musica in Rome on 23 January for the Accademia Nazionale di Santa Cecilia. Gloria will also make her debut with the English Chamber Orchestra in London next March. "I felt like a little concert pianist at the tender age of two." Despite the long list of prizes she has won, Gloria is still as unspoiled and spontaneous as she was as a little girl of two, who was given a little red piano with red and white keys for her birthday, with which she astonished her family and friends by pretending to give a virtuoso performance. "I was only 2 years old," she said, "but it was an amazing gift. I felt just like a little concert pianist. My mother was shocked because, although I obviously couldn't play properly, I did make a very good imitation of real piano players, even striking different keys with my fingers apart." Despite this impressive little performance, no one in her family could have imagined that this little girl would grow up to be one of the most interesting young pianists, playing at all the major music festivals on all continents. Even Gloria has been surprised by the speed at which her musical career took off. It was not long before her performances were being reported in the international press, and radio and TV appearances followed. A whole series of complimentary reviews appeared. "Gloria has been praised for the extremely deep musicality, remarkable fluidity, nuancing and sense of style," wrote Walter Arlen in the Los Angeles Times, while Marcello Abbado, the famous Italian composer and pianist who was the Director of the Milan Conservatory for many years, was also deeply impressed. As he once put it, "Gloria knows how to emotionalize and to convey her sentiments through her music." When she talks about her great love of music, Gloria's eyes sparkle and her words are accompanied by graceful, dance-like gestures. She smiles warmly. "The passion for music is in my heart," she says. "It is always with me, it never leaves me. When I feel lonely, I have my music to comfort me. Leading a life at the top is very difficult. I am always travelling a lot and I have been far from my family and my friends, all my loved ones, all the time since I was a child. What I find in my deepest self is the passion for this amazing thing that is music. Without music I would feel lost in this environment." Apparently without effort, but in fact thanks to her constant dedication and hours of daily practice, Gloria has won an impressive number of prizes and awards, including the Ibla Grand Prize and Prokofiev Special Award in Sicily in 2009. which led to her first US tour and het debut at Carnegie Hall in New York in 2010. In 2011, the centenary of Liszt's birth, she was awarded the Prix de Jury - F. Liszt at the XI Concours International de Musique du Maroc in Casablanca. 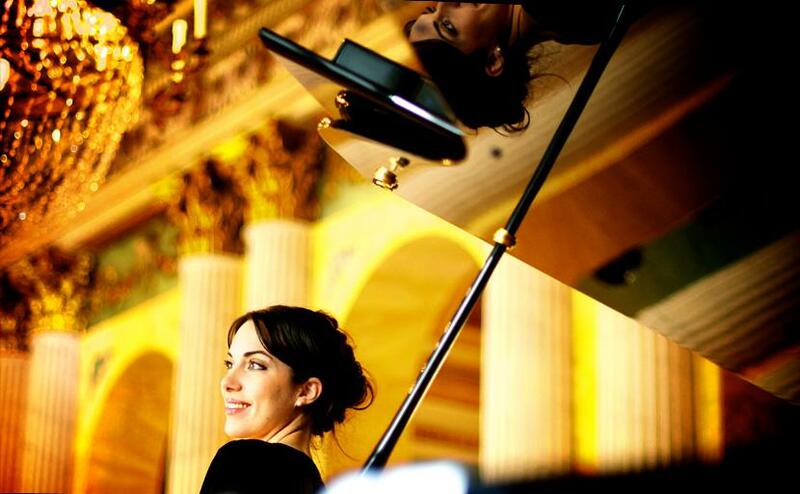 She also won awards at various international competitions such as the Cantù International Piano and Orchestra Competition in Como in 2009 and the Vlado Perlemuter European Piano Competition in Le Havre, France, also in 2009, and was awarded the R. Schumann Prize at Pistoia, Italy, in 2008. In 2009 she won the Silver Medal at the Los Angeles Paderewski International Piano Competition, as well as the Paderewski and Chopin best performance special awards. Gloria Campaner was appointed European Ambassador for Culture for 2010/11 within the framework of the EU-funded project "The piano as a reflection of European culture", and the European Prize for Culture awarded by the "Pro Europa" Cultural Foundation in Freiburg (Germany) in 2011. In addition, she has received scholarships from the Brahms Foundation in Baden-Baden (2009) and the Società Umanitaria of Milan (2007). Gloria lives in Rome, where she practises yoga and tai-chi, she cherishes her very deep passion for cinema and plays guitar and trumpet from time to time as distractions from her career as a pianist. "I love playing the trumpet," she says, "because it's such a challenge to produce even simple sounds out of this instrument." Shortly before Chirstmas 2013, Gloria received an unexpected phone call in Rome from the world-famous Japanese pianist Mitsuko Uchida, who was speaking from London. After introducing herself, Mitsuko said simply, "I am a pianist." Gloria was astonished by the call that all she could think of in reply was, "Yes, I know you are a pianist." But Mitsuko Uchida had a another very important message: "Gloria, I am very pleased to tell you that you are one of the winners of this year's Borletti-Buitoni Fellowship, which is worth £ 20,000! Welcome to the BB Trust Family." "I was the first Italian pianist to win the Borletti-Buitoni award!" The fellowships awarded by the Borletti-Buitoni Trust are among the most prestigious awards for young artists, who are at the beginning of their career. Gloria can still recall the amazement she felt when she received this phone call and the laconic way in which Mitsuko Uchida introduced herself. Gloria: "At first, I thought: This must be a Christmas joke. But it was not. Mitsuko Uchida is the pianist on the artistic committee, and she obviously decides which pianist is going to get the award. And she chose me. I have won about 20 prizes in my career so far, but this is the one that means most to me, because I have got her special appreciation and also because I am the first Italian pianist to have won this prize. I felt so honoured you know." Gloria has already spent some of the prize money on repairs to her Steinway B piano, which she needs to be in perfect condition. And she has used part of the rest to finance her production of Luca Scarzella's film Humoresques | Heroes Quest, a documentary of a piano and dance fusion piece by the Dutch choreographer Joost Vraunraets commissioned for the opening of Renzo Piano's remarkable new Auditorium del Parco in earthquake-stricken l'Aquila, the capital of the Abruzzo region in Southern Italy. "My family is full of artistic, creative minds." Gloria Campaner was born in Jesolo by the seaside near Venice and comes from a very artistic family. Gloria: "My father was an actor. When I was young he dedicated all his time to theatre, comedies and script-writing. My mother was always interested in art and dance, and we have some very great musicians in our family. Some composers, an organist, a guitar player, and one of my uncles is a great painter. They are all artistic, creative minds. Despite all these artistic gifts, we were just a poor, simple family, living in the countryside, running a big fish restaurant." "If I don't play music, I get sick"
"I lived in Jesolo until I was 17. I had the loveliest parents, especially my mother was very important for me. When I was 4 years old, it seemed impossible that I could become a top musician, but my mother always believed in me and encouraged me. I became very interested in biology in high school when I was 16, and for a while I wanted to become a biologist ora bio-engineer. And my mother said: "If you want to shut yourself up in a laboratory and spend your life there, then go ahead. Good luck!" But she never pushed me in any direction. And eventually, my passion for music prevailed. If I don't play music, I get sick, I get fever and stomach ache." "This girl is very gifted"
Daniela Vidali was Gloria's first music teacher, at the Monteverdi Music School in Musile di Piave. Gloria remembers: "Daniela spent much of her time teaching children. When she hear me play, she immediately said to my mother: This girl is very gifted. She has absolute pitch and a good rhythm. My mother was unaware of this. I studied with Daniela for many years, though she sent me to various other teachers, including Bruno Mezzena, when I was 10, because she thought I needed their help in particular disciplines. Daniela was a real mentor, and a pianist with a great technique. But she was very strict. She would never praise me to my face: it was only later, when I read compliments of her in the newspapers, that I knew how much she really liked my playing. She is very moved by my success: sometimes, she even cries when she hears one of my concerts." "Bruno Mezzena made me feel that studying the piano was like entering a sanctuary." Gloria Campaner never studied full-time at a conservatory. She mainly took private courses and did her music exams in Padua, Trieste and Bologna. Bruno Mezzena, the founder of the Quintetto Italiano, had to be persuaded to become her teacher, because at first he refused to teach children. But Daniela Vidali begged him to accept her as a student. "Bruno Mezzena taught me for almost 10 years, from the time I was 10," Gloria explains. "He lived in the south of Italy, but at that time he was teaching in Conegliano near Venice. I was very lucky, because he was giving a master class every month, which I was allowed to attend. He was one of the main pupils of the great Italian pianist Arturo Benedetti Michelangeli, one of the most incredible pianists who ever lived. Mezzena had a deep respect for the score of the music to be performed. He made me feel as if I was entering a sanctuary every time I visited him. He always paid such close attention to the score and would never allow me to deviate from it. He was also a very strict teacher, but I admired him so much because he taught me to respect the musical text. That attitude has stayed with me right up to the present day. Despite his devotion to the score, he was very fond of contemporary music. He always said that a musician can only be a real artist if he is playing the music of his own time." After she had been with Mezzena for almost 10 years, Gloria felt that it was time to look for a new teacher. She travelled to many countries and gradually became very interested in the Russian School. "Bruno Merzzena was quite old by this time," she says, "but he retained his deep love of music. He taught me how to play, but never prepared me for big stage performances. I was still a young girl, and I needed a change. So I started to look for the best teacher for me. I wanted the best of the best. I met amazing musicians like Lilya Zilberstein and Dmitri Bashrikov and took some lessons with them. And then I met Konstantin Bogino, the pianist of the Tchaikovsky Trio. He became my teacher and he still is. I took lessons from him mainly in Paris, because that is where he lives, and in Milan and Rome. Through him, my interest in the Russian School deepened. My favourite pianists and composers at the time were Russian, and I only listened to Russian music. I found everything that came out of Russia, especially Russian culture and music, so inspiring. I was also taking Russian language and literature courses at the university in Italy. Gloria first met Konstantin Bogino in Milan, where he was giving a seminar. When she met him, she immediately felt that he was the opposite of Bruno Mezzena and that he was the person she needed. "Bruno would never get up from the piano," Gloria explains, "he wouldn't move his head. He didn't even look at me. And this man, Bogino, was suddenly singing, moving and touching me. He was full of passionate gestures. I was even scared at the beginning, because I thought: this guy must be crazy. He was making music with all his aura. I was totally shocked. It was a completely new chapter in my life. He was crucial for my development. I started studying with him when I was 18 and I am still studying with him. Still I can't say that one of my teachers has been the best. Each of them has had a crucial impact on my career. And they all became mentors for me. They were more important than a family or a boyfriend, you know. Suddenly they were more important than anybody else." Gloria Campaner has released one CD for EMI, entitled 'Piano Poems', featuring music by Schumann and Rachmaninov. Her second CD will be released in January 2015, dedicated fully to Rachmaninov, a live performance of his second Concerto (see video fragment above, piano concerto 2 opus 18). All in all Gloria is very charmed and inspired by Rachmaninov's music and his personality; the fact that he is such a typical representative of the Russian School certainly plays an important role here, as Gloria explains: "The Russian School impresses me so much, because I feel that it is closest to the truth. There has been such an incredible outpouring of art and music, classical music and genius in all its forms from Russia. All the best composers and players after the Classical period were Russian: Tchaikovsky, Rachmaninov, Stravinsky, Shostakovich, everything comes from there, and they have such an amazing technique. You need to master that technique to play Russian music properly." Rachmaninov was known for having big hands and long, strong fingers, which enabled him to play pieces and complex chords that were beyond most of his contemporaries. That is one of the features that attracted Gloria to Rachmaninov's music. "When you see that you can play these pieces, you know that you have reached a good level and you hope that you are improving. I knew I had to master the Russian technique, and to train and strengthen my fingers, if I was ever to play Rachmaninov properly. I am constantly exercising my hands and my fingers a lot. Apart from my piano practice, I work a lot on certain muscles of my hands to make them stronger. You can get incredible muscles in some parts of your hand by exercise. You close the piano and simply exercise your fingers. Konstantin Bogino taught me how to do it. He has been my best guide to Russian music. The music of Rachmaninov is very romantic. One of my strongest passions in life is dance. I started taking dance lessons and artistic gymnastics when I was 7 and I always think that it is important to convey the spirit of dance even when I am playing the piano. I try to link my body to the music, though I don't force myself. It is quite natural. I try to imagine that the movementis are creating the sound. So when my arms are moving, the sound is like a continuation of my arms into the strings of the piano." Gloria won the Paderewski and Chopin best performance awards in Los Angeles in 2010. She was very surprised and gratified by this recognitionof her skills in the interpretation of these two Polish composers. "It was amazing," she enthuses. "It was a big competition and I didn't think I was such a great performer of Paderewski's music. I was shocked when I received the best performance award. It convinced me that there really is something between me and Poland. I have always admired and loved Chopin, but Paderewski was new to me. I read his biography because I had to play his work for the competition. This taught me that apart from writing incredible music he has had a fascinating life." Ignacy Jan Paderewsky was Prime Minister and Minister of Foreign Affairs of Poland from January 1919 until December 1919. He became a world-famous pianist and composer as well - after having endured massive criticism from so-called experts who claimed that his hands were the wrong shape for playing the piano. Nevertheless, Paderewski continued to believe in himself and to follow his own path. He practised for many hours a day, sometimes even so long that his hands started to bleed. His perseverance enabled him to become one of the greatest piano players in the world. "I admire his enormous belief in himself, his ability to make his own way in life despite all the discouragement he received from others," Gloria says. "There are always so many reasons for giving up if you follow other people's advice. I read an amusing example of his perfectionism in his biography. He used to practice playing the piano in a room lined with mirrors, because he had once seen a pianist whose performance was ruined by the exaggerated facial expressions he made while playing. So for a whole year, Paderewski would observe his own expressions while he was practising in the mirrors and with the aid of a camera, until he could play without moving a single muscle on his face. After that, he would look completely impassive while playing in his concerts. The music was coming from his heart, but his emotions were not reflected in his face. I admire his personality as well as his music." Paderewski also used to say, "I never train the hand apart from the ear." Gloria follows his example here too. "I also train my ears by listening to music while reading for example. I try to imagine the sound of the music before I play it." In the meantime, Gloria was getting tired of living in Italy and wanted to discover new worlds. She wanted to change her life completely. She travelled to America and other countries and then when she was back in Italy she suddenly met Fanny Solter, a music teacher, born in Brasil but living in Germany. "Fanny came into my life at just the right moment," says Gloria. "She is one of the most incredible persons I have ever met. I was living in Pescara at the time, and Fanny happened to be giving some master classes there. She then suggested to study with her in Germany. I had a scholarship and decided to do a postgraduate course in the piano for concerts and solo performances at the Karlsruhe Hochschule, where she was teaching. I told Konstantin Bogino about my plans to move to Germany, and he encouraged me to go ahead with my plans while continuing to study with him in Paris. He also commented that it would be a good thing for me to learn another new language." "She had the sunshine in her heart"
"Fanny Solter has become a very special person for me. She is one of the most charismatic teachers in Germany. She is Brazilian, from Rio de Janeiro, and moved to Germany to study with great teachers. Fanny is everything to me: a friend, a mother, a grandmother, a mentor. When I met her, I saw she had the sunshine in her heart, because of her Brazilian roots. She was the most sunny and generous person in my life. I studied with her in Karlsruhe for 6 years, until I completed my training as a soloist at Karlsruhe Hochschule 3 years ago. Fanny not only taught me how to refine my instinctual approach of playing, which was the way I liked to do things, but also made me go back to basics. This has had a big impact on my piano technique. She had really good views on classical music too. She taught me about Beethoven, Bach and other Gerrman composers. She was very keen on harmony and composition. I still visit her at her home in Germany and we meet in Brazil once a year. I feel so happy with her, this year we will spend Christmas together."